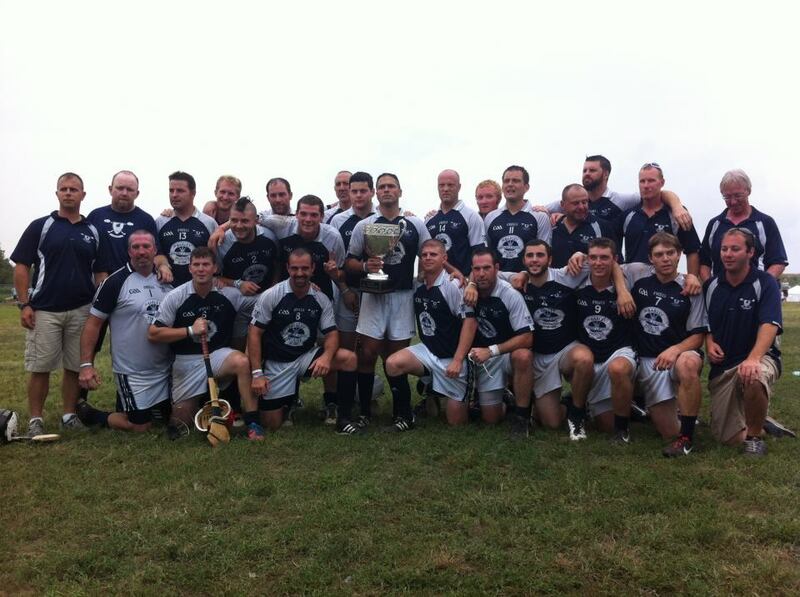 Portland Hurling Club Junior C team travelled to Philly as runners up of the Northeast junior C hurling championship. The boys from Maine traveled with just one sub, and were also missing some key players who could not make the trip. The Mainers went down on Friday to a strong team from Indy, which pushed the Mainers into the shield competition for the second year running. The Shield was run off on Sunday, and Portland played three matches, all on Sunday, against Portland Oregon, DC, and Denver (final). With a great effort from all involved and solid performances from Matt Gormley and Larry Maher Portland ended up winning the shield for the second year in a row. The Junior A Hurling Championship Stayed in the Northeast with Fr. Tom's. New Hampsire's Barley House Wolves Brought the North American Trophy Back to the Granite State. On Day one, Friday, of the NACB finals at Pennypack Park in Philadelphia conditions were warm and the fields were in good shape. There were 6 teams from the Northeast division in action and five came through their early round games. Saturday did not get off to the best of starts from a Boston standpoint. The Cork junior B’s went down to a young, fresh Baltimore side. The game was level at half time but Baltimore put three points on the trot over the bar in the second half to take control of the game. Trailing by five points with five minutes left Cork pulled back a goal and had a chance to goal again but missed. Baltimore made sure of it with a minute left with a goal of their own. The Donegal junior A footballers went down to Padraig Pearses from Chicago by a score of 2-6 to 2-9. On the plus side, Shannon Blues senior footballers made the senior football final by defeating Vancouver by a point in a dour affair. Though the Blues got off to a great start thanks to a Caolan Rafferty goal, the Blues trailed for most of the game and came through in injury time. Kieran Hurley was also sent off 5 minutes into the second half, and the Blues trailed by a score of 1-5 to 1-7 coming into injury time, but three points on the trot saw the Boston champions through. A better performance would be required in Sunday’s final against Ulster San Francisco. On the junior hurling front, The Barley House Wolves made short work of St. Louis in their semi-final and move on to another NACB final where Allentown stood between the New Hampshire boys in their quest for the cup. Fr. Tom’s beat the Celtic Cowboys from Austin Texas to make the junior A final where they would play Toronto. The Texans had been promoted from junior B but Tom’s were a bit too much for them to handle. Michael Markham came off the bench to net a hat trick, and American Boron Mick Lawrence got his first score for Tom’s with a point. The senior hurling final was played on Saturday at the request of Na Fianna, and the westerners won their second North American title in a row at the expense of a team from the Northeast. Wexford traveled to Philadelphia just short of a few who had won the championship in Boston last weekend, but hoped for a NACB cup to go with the Boston trophy. Trailing at the break by a score of 2-11 to 1-5, Wexford put in a tremendous performance to stage a comeback from a massive 15 point deficit in the second half. In goal for Na Fianna was Waterford reserve keeper, who stopped three or four goal bound shots at the death as Wexford tried to pull off the impossible, but it was not to be. The Slaneysiders fell short by four points, Final Score Wexford 5-10 Na Fianna 4-17. Eire Og entered a team into the camogie competition but also came to end of the road on Saturday. Fr. Tom Burke’s win the junior championship with a fine display against a tough Toronto team in the final. While the scoreline of 5-16 to 3-5 might indicate a one sided affair, that was not the case. Tom’s led by 1-10 to 1-3 at the break, but shortly after the second half started Toronto fired in a goal and a point. Tom’s went scoreless for 10 minutes, but came good towards the end. Michael Markham and John Cuddy each netted, and Tom’s got some crucial scores from Cormac Joyce-Power down the stretch. Fran Keenan made no mistakes in goal and the puckouts were excellent. The back line was solid with a fine display from Dylan Costello, along with Tom Corcoran, Kevin Mooney and James Dooley. Barry Smith put in an excellent 60 minutes in the middle of the field, while David Hession did a lot of damage in the forward line. The junior C hurling cup also went to the Northeast as Concord New Hampshire’s Barley House Wolves defeated Allentown in a nail biting final. With the game tied at 0-8 to 1-5 at the break the Wolves got their noses ahead. Driven on by Mattie Pulomina and with Rory O’Mahoney on target several times, the Wolves got into a three-point lead. It took a great save from Denis Treanor in goal to maintain it, and the back line were put on their heels several times by Allentown’s speedy forwards. Unlike last year, when the Wolves were turned by a goal in the final minutes, the New Hampshire-ites were determined not to let it happen again and held out until the final whistle. A first North American for the Wolves and a very satisfying win in their sixth year of existence. The senior trophies eluded the Northeast this year as Connacht Ladies fell to the hosts, Notre Dames of Philly. At the break the Boston champions had it all to do as Notre Dames led by a score of 0-8 to 0-2. The back line had their work cut out for them as the local girls piled on the pressure. Eventually it told as Notre Dames banged home three goals to win by a score of 3-12 to 0-8, and the Ladies Senior Football Championship remains in Philadelphia. Shannon Blues senior footballers also had a tough run. Having come through their rousing extra time Boston victory one week ago, the Blues made the final having played on Friday and Saturday. The Blues, playing their fourth game in 8 days, were up against a strong Ulster side from San Francisco. The Boston representatives also went into the game without key men Kieran Hurley who had been red carded in Saturday’s semi-final and Sean Moriarty who shipped an injury and could not play, leaving the team with 7 players who started last week’s final in Boston. The Blues fought hard and had a few chances at goal that slipped by, but Ulster just about deserved to come out on top by a goal. Two cups to Boston, maybe there will be one or two more coming back from Cleveland next year. Thanks to all the reporters on the ground in Philly for helping get this together! Gerry, Jamesie, Christina, David, Lore, Rob, Noel, and Laura. On the plus side, Shannon Blues senior footballers made the senior football final by defeating Vancouver by a point in a dour affair. Though the Blues got off to a great start thanks to a Caolan Rafferty goal, the Blues trailed for most of the game and came through in injury time. Kieran Hurley was also sent off 5 minutes into the second half, and the Blues trailed by a score of 1-5 to 1-7 coming into injury time, but three points on the trot saw the Boston champions through. A better performance will be required in Sunday’s final against Ulster San Francisco. On the junior hurling front, The Barley House Wolves made short work of St. Louis in their semi-final and move on to another NACB final where Allentown stand between the New Hampshire boys in their quest for the cup. Fr. Tom’s beat the Celtic Cowboys from Austin Texas to make the junior A final where they play Toronto. The Texans had been promoted from junior B but Tom’s were a bit too much for them to handle. Michael Markham came off the bench to net a hat trick, and American Boron Mick Lawrence got his first score for Tom’s with a point. The senior hurling final was played on Saturday at the request of Na Fianna, and the westerners won their second North American title in a row at the expense of a team from the Northeast. Wexford traveled to Philadelphia just short of a few who had won the championship in Boston last weekend, but hoped for a NACB cup to go with the Boston trophy. Trailing at the break by a score of 2-11 to 1-5, Wexford put in a tremendous performance to stage a comeback from a massive 15 point deficit in the second half. In goal for Na Fianna was Waterford reserve keeper, who stopped three or four goalbound shots at the death as Wexford tried to pull off the impossible, but it was not to be. The Slaneysiders fell short by four points, Final Score Wexford 5-10 Na Fianna 4-17. Eire Og entered a team into the camogie competition but also came to end of the road on Saturday.